You may wish to share your athlete’s information with another parent or guardian. Do not create more than one account for your athlete or their information will not be synced between devices. 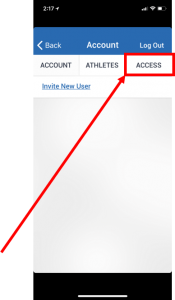 Instead, you can invite new users to your existing athlete account. Once you invite them they will receive an email with information on how to set up their own account. They will have their own username and password but will be able to access your athlete’s information. 1. Go to the ”Account” tab. 3. Select “Invite New User”. 4. Enter in the New User’s Email. You can include a custom message. 5. Click “Send” to email. The new user will receive instructions on setting up their account. They will create their own login information to access your athlete’s information.